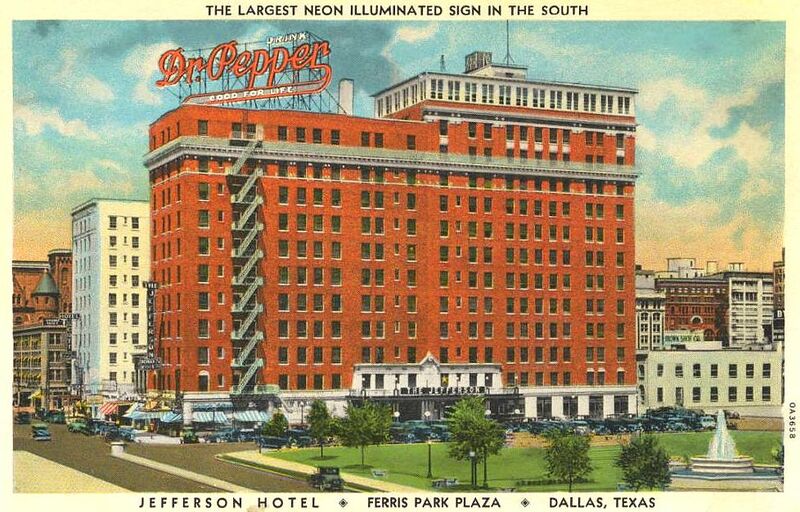 The Jefferson Hotel probably made some serious money leasing out rooftop acreage to the Dr Pepper people who had that huge neon sign erected there. The hotel was located across from Union Station and a couple of blocks from the Old Red Courthouse. For people approaching the city from the southwest, there was absolutely nothing between them and that refreshing beacon rising tantalizingly above S. Houston and Wood streets. It’s surprising Dallas didn’t have more neon back then. With a pioneering hometown neon company, the Dallas skyline should have been lit up like a Christmas tree 24 hours a day! Postcard is from the George W. Cook Dallas/Texas Image Collection, Central University Libraries, Southern Methodist University; it can be viewed here. First black-and-white photo was purchased at an antique mall or flea market, origin unknown; found here. 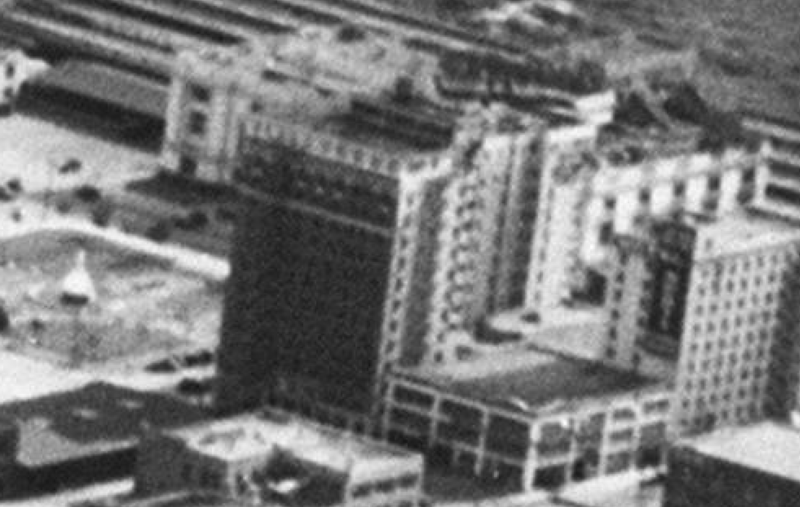 The 1940s-era aerial photo is a detail of a larger photo, “Downtown Dallas looking east (unlabeled)” by Lloyd M. Long, from the Edwin J. Foscue Map Library, Central University Libraries, SMU; the full photo can be viewed here. A great photo of the hotel and sign can be seen in Sam Childers’ Historic Dallas Hotels, here. 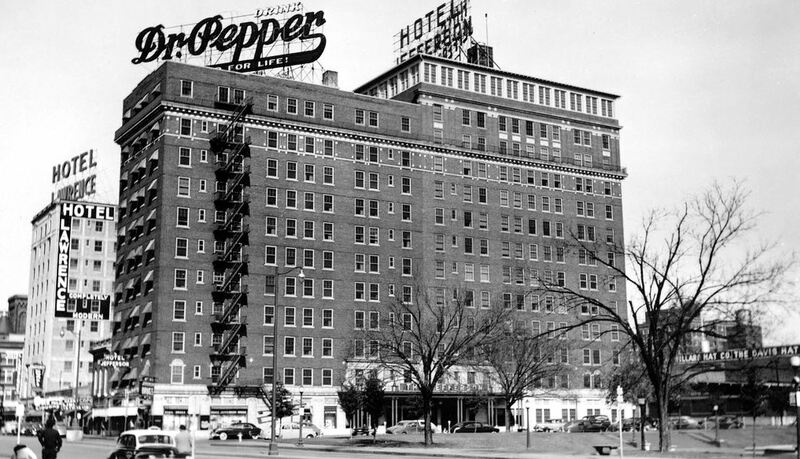 Childers writes that the Dr Pepper sign came down when the Jefferson was sold and became the Hotel Dallas in 1953. 20-some-odd years for a sign like that to remain in one place is a pretty good run. 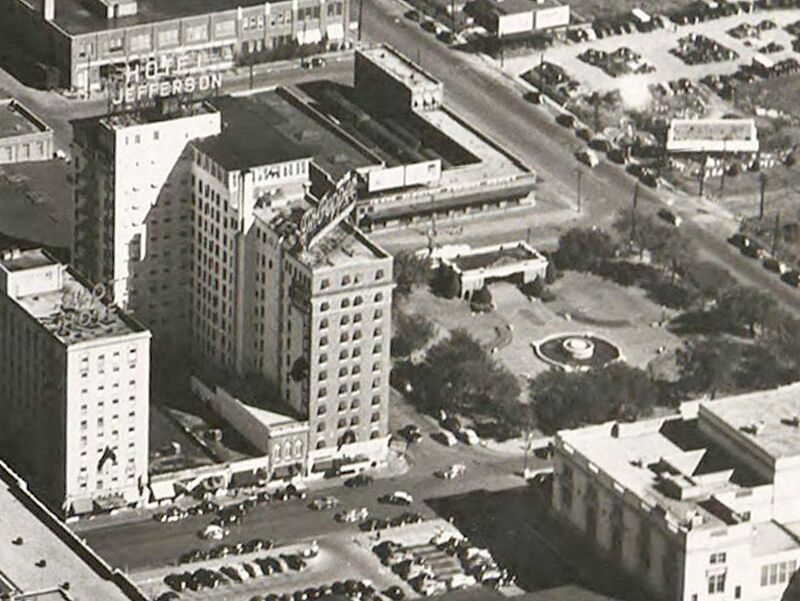 The Jefferson Hotel (or as it’s sometimes identified, “Hotel Jefferson”) was at 312 S. Houston St. The building was demolished in 1975, as can be seen in a Dallas Morning News photo on the DMN photography blog, here. It is now a hotel-shaped parking lot. Thank you for your post about Dallas artists in the 60s and 70s! And how interesting to read Janet Kutner’s reviews again! Regarding neon, I really miss the Esquire and the Broadway-like look of Oak Lawn that has disappeared. Phil’s, Jay’s Marine Grill, The Flower Shop, Lee Optical, that big neon stiletto shoe. Any pictures of those gems? Speaking of neon — How about the China Clipper on McKinney? Thanks, Craig. Maybe there was more neon than I was aware of! I’ll keep my eyes peeled for some cool color photos. Also this book: https://books.google.com/books?id=ZjHXkDJEtFYC&pg=PA54#v=onepage&q&f=false says that the sign came down in 1953 after new owners changed the name to Hotel Dallas.